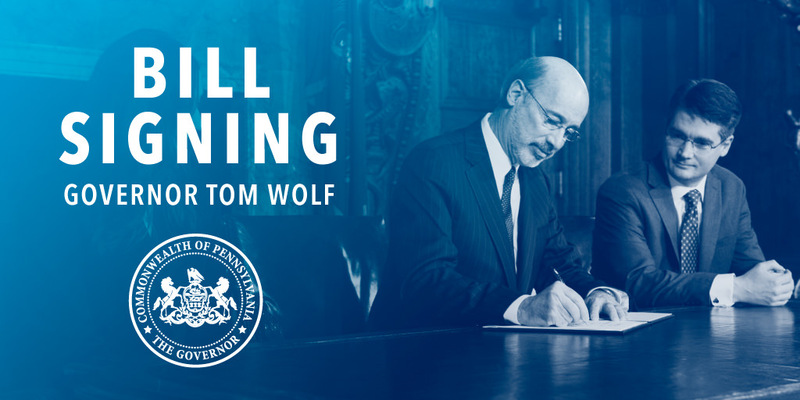 Harrisburg, PA – Governor Tom Wolf today signed 12 bills into law, including Senate Bill 279, which will allow for new regulations aimed at protecting the environment, water supplies and public areas from effects of unconventional oil and gas drilling, most commonly referred to as ‘fracking’. The new Chapter 78a regulations set forth new standards to protect public resources, including water, land and places like parks and schools. The new regulations also improve landowners ability to express their concerns and modernize the regulatory program to recognize advances in technology. Act 47 – House Bill 57, sponsored by Rep. Payne, amends Title 66 to enhance natural gas competition in the Commonwealth. Act 48 – House Bill 264, sponsored by Rep. Mustio, establishes the Care Facility Carbon Monoxide Alarms Standards Act and requires care facilities to install approved carbon monoxide alarms. Act 49 – House Bill 1199, sponsored by Rep. Taylor, repeal the act of May 27, 1965, which authorized the Department of Highways to erect and maintain a bridge over the Monongahela River in Washington and Allegheny Counties. Act 50 – House Bill 1241, sponsored by Rep. Brown, amends Title 66 regarding the definition of “public utility,” providing an exception that resorts offering water or sewer services to private homes who take service at a point within the property boundaries of the resort are not a public utility. Act 51 – Senate Bill 179, sponsored by Sen. Greenleaf, codifies various existing Pennsylvania laws concerning hotels and lodging into a single chapter under Title 48 (relating to lodging and housing) of the Pennsylvania Consolidated Statutes. Act 52 – Senate Bill 279, sponsored by Sen. Hutchinson, establishes the Pennsylvania Grade Crude Development Act, creates and provides for the duties of the Pennsylvania Grade Crude Development Advisory Council, and abrogates the recent regulation relating to conventional oil and gas wells. Act 53 – Senate Bill 772, sponsored by Sen. Gordner, amends the Professional Psychologists Practice Act provisions relating to the scope of practice and licensure for the practice of psychology. Act 54 – Senate Bill 837, sponsored by Sen. Aument, prohibits individuals from using various professional titles unless the individual has received a license as a marriage and family therapist. Act 55 – Senate Bill 983, sponsored by Sen. McGarrigle, requires the Department of Transportation to issue a disability plate for a parent or spouse of an individual with a disability. Act 56 – Senate Bill 1077, sponsored by Sen. Vogel, removes the requirement for school boards to mail notifications to students and their parents or guardians of the school board’s policy regarding audio taping on school buses and school vehicles. Act 57 – Senate Bill 1195 amends the procedures relating to the General Assembly’s review of the Department of Environmental Protection’s state plan relating to greenhouse gas emissions. Act 58 – Senate Bill 1232, sponsored by Sen. Corman, authorizes the Department of General Services, with the approval of the Governor, to grant and convey certain lands and improvement in Rush Township, Centre County to the Moshannon Valley Economic Development Partnership, Inc.